The latest electric car technology is being trialled in Lincolnshire as part of a drive by the police and crime commissioner to create the “greenest” police force in the UK. PCC Marc Jones has already instigated a project to change lighting at Lincolnshire Police headquarters to LEDs – saving the equivalent of two officers’ salaries a year. And he has commissioned a full report on the latest sustainable technologies available to the force, which will form the basis of a new environmental strategy. The first step for Lincolnshire Police is to trial electric cars and officers are currently testing the Nissan LEAF. Initially the force is looking at electric vehicles for community roles rather than pursuit. The Nissan LEAF is said by the force to have a range of up to 155 miles and is fitted with a braking system which converts some of the energy lost from braking into extra charge for the battery and stores it for later. Mr Jones said: “I’m ambitious for Lincolnshire Police to become the ‘greenest’ most sustainable force in the UK. “I have requested a full assessment of opportunities to develop this aim. I want to see our buildings assessed for opportunities to be more efficient and to embrace new technologies to reduce carbon footprint and cost to the taxpayers of Lincolnshire. “I want to see the vehicles used by the force keeping pace with operational requirements but also with changing technology to ensure pollution and fuel use is kept to a minimum. 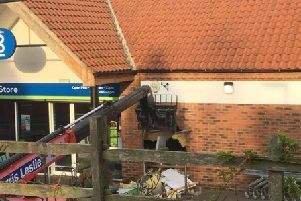 This would require charging points installed at all the county’s police stations, as currently there are barely any public charging point anywhere on the eastern side of Lincolnshire. The trial and drive for a sustainable force is backed by Chief Constable Bill Skelly. “I want Lincolnshire Police to make a positive contribution to the county, providing excellent policing, but we also need to look at how we deliver that service. To that end, I want to explore all options for improving our energy efficiency,” he said. The LED project, which cost £350,000, has been paid for using a Government backed funding scheme which means the force pay back the cost of the work from the savings made. The force has some way to go to catch up with the likes of Gloucestershire Police who have been using a fleet of seven Nissan LEAF electric cars since the summer of 2016. He said they are committed to environmentalism and have been awarded for their drive to reduce energy consumption. He and the Police and Crime Commissioner went to a low carbon conference and discovered zero emission motorcycles being trialled in london and hybrid engine police vans, fitting in line with EU rulings on emissions.